We are more gorilla than we thought. Chimpanzees are in fact our closest cousins. After sequencing their genetic code, scientists have found that 15 per cent of a gorilla’s DNA is closer to humans than a chimp’s. In fact, gorilla’s sense of smell, eyesight and taste are very similar to that of the human. The gorilla’s hand looks almost identical to a human hand, with five fingers, including a thumb. Additionally, a gorilla has unique fingerprints just like humans and other primates. 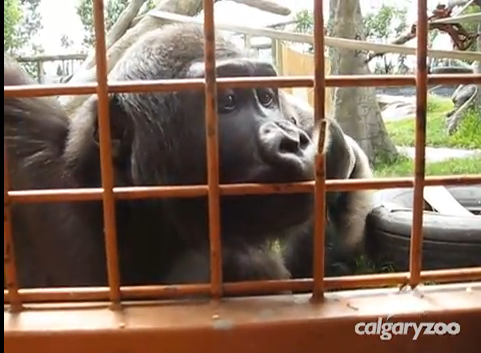 The Calgary Zoo, Canada's second largest zoo and home to over 1,000 animals, excluding individual fish and insects, and 290 different species, recently uploaded a video on YouTube of two gorillas inquisitive interest with a Caterpillar that was making a trip across a door in their enclosure. The video has received more than 165,000 views and have gained the attention of major news outlets. As you can these gentle giants are as curious and inquisitive as the average human being.